I won’t apologize for this absence, as I spent it lounging around the cottage. I also managed to produce a few things as well! For this trip I decided to finally give Kumihimo a try. Working with ribbon is a lot more travel friendly than large quantities of jump rings. So here is what we ended up with. A lanyard in my companies colours to keep my security pass on. 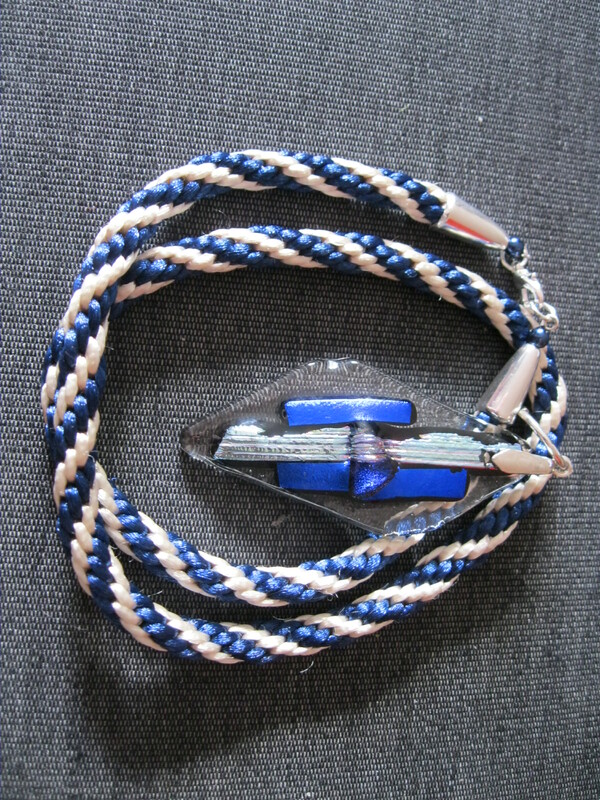 A necklace to hang this stunning glass pendant on that I have had for ages! 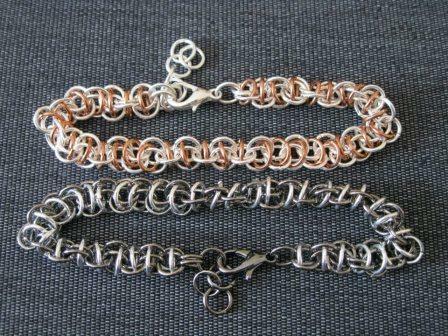 Not that I neglected my chain maille passion! Before we left, I got together for tea and beading with my friend Meghan and took some fabulous dyed shell discs and combined them with some byzantine in black nickel 7mm. I really like the effect! and I finally found a way to use a little something I put together ages ago. 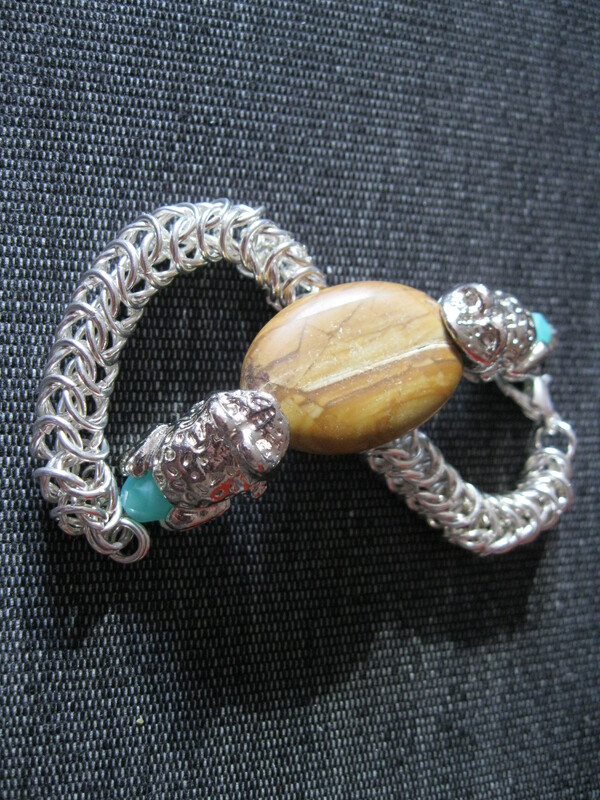 I made this piece with two frog beads that I just loved but were designed for pandora style bracelets so I put them together with some other beads to make what could have been a brooch or bracelet, a necklace or anything really. I had some full Persian in silver plate and thought, “aha”, so now I have a hungry froggy bracelet. I am looking forward to wearing this one to work tomorrow. A little of this…a little of that and VOILA! 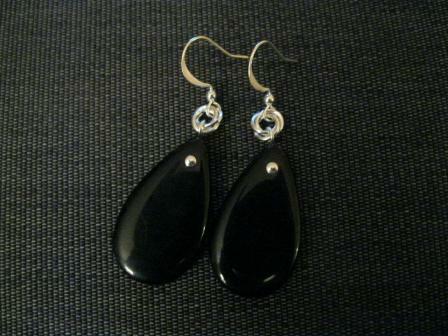 So it hasn’t been an overly productive week in terms of jewellery creation. I did finish my cloisonné and robin’s egg crystal necklace which I did take a picture of and completely forgot to download…I will add that tonight! So this morning as I was readying myself for work I decided to wear my favourite WM Fun earrings, My black and silver orbital bracelet combined with my black and blue pearl in a cage bracelet, all of which go nicely with my outfit today. There was just one thing missing, which I realized as I was packing up my lunch…no necklace! GAH! Leave the house without a necklace? !, oh dear me no! The problem was, I didn’t think I had time to run back upstairs and I really didn’t know which one would work. 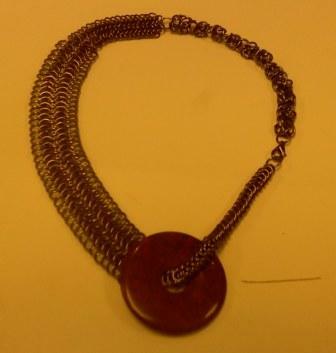 That was until I looked into my Chain-Maille-To-Go box and realized that in there was a 3/4’s finished black nickel chain maille necklace with a large red stone donut. 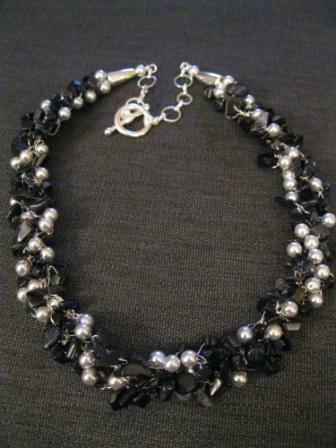 Now I was trying something different with this necklace when I started it a while ago. Ok, a LONG while ago. 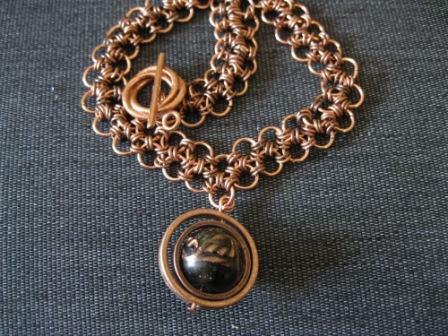 I wanted it to be made up of different styles of chain maille, all in black nickel. So it starts off with 6-1 European in 6mm rings, jumps to 6-1 European in 9mm rings, then abruptly changes to full Persian in 6mm rings again. This point is where the stone donut sits. 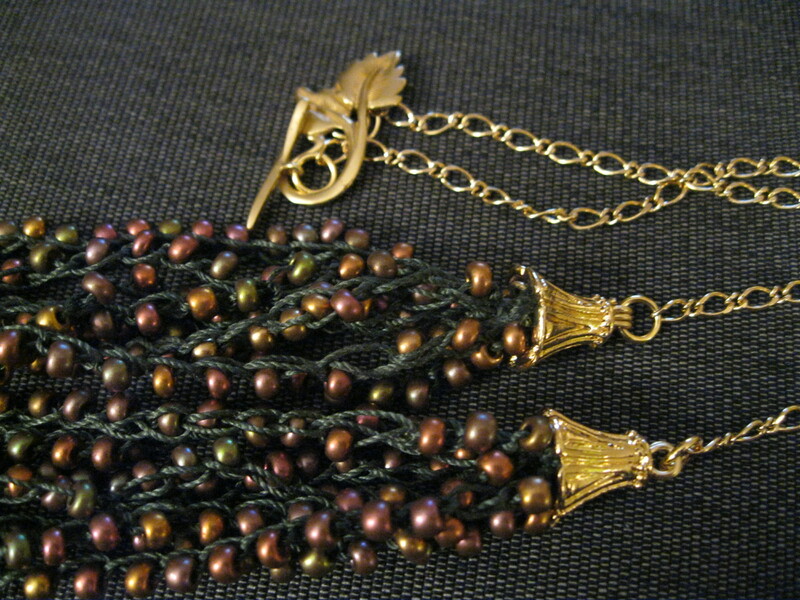 I was still missing about 3 or 4 inches of the full persian to finish the necklace as of this morning. Luckily enough, there in the box with it was a black nickel byzantine bracelet in 9mm rings. A few seconds with the pliers and VOILA! I apologize for the terrible picture…my cell phone camera isn’t great. I am quite pleased with the results of this little experiment, it’s funky, a little lop-sided…very me. Til next time…keep those pliers handy! 2 heads are often better than one! It has been too long since my friend Meghan came over for a tea and beading date. Finally today we were able to do so and it’s a good thing too, because she was able to help me with a little problem I was having. I posted a week or so ago about the antique brass bracelet that I couldn’t finish because I had run out of brass rings. Well, not only did Meghan help me find a way to make it work, by adding more cloisonne beads, but it looks way better! 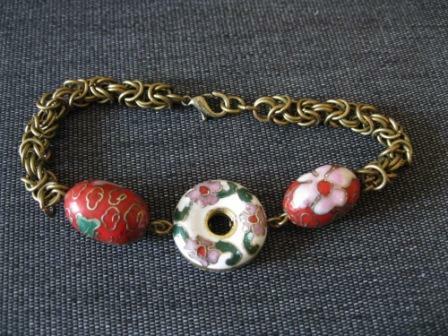 Now I have the two red cloisonne beads, but have added this fabulous White Cloisonne donut to the centre, and if you use two head pins instead of an eye pin to go through the donut, you can keep it empty in the centre without seeing the pin! I really like the effect! 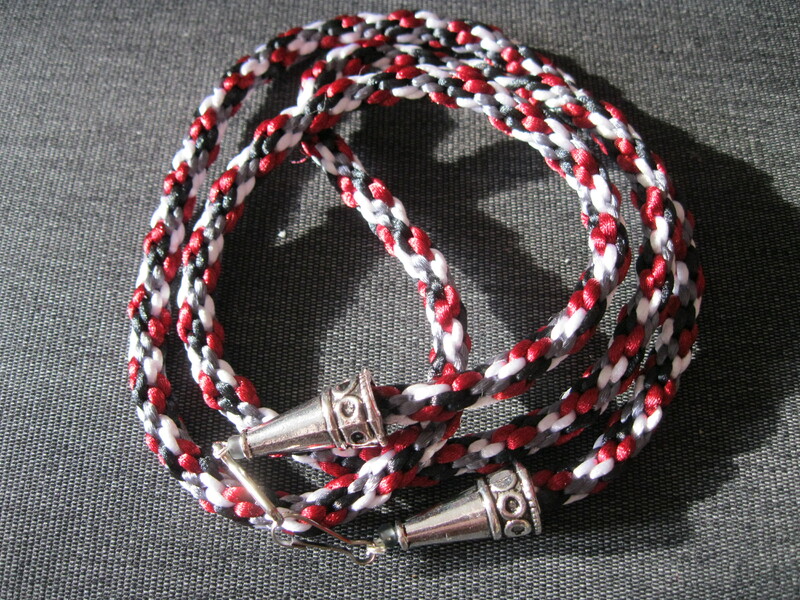 I also started a new 6-1 necklace, but I didn’t take any pictures, because I didn’t get enough of it finished for it to look like anything just yet. I did finish 2 pairs of earrings and then get 3/4’s of another necklace done before running out of those rings (I intend to pick some up this week!). 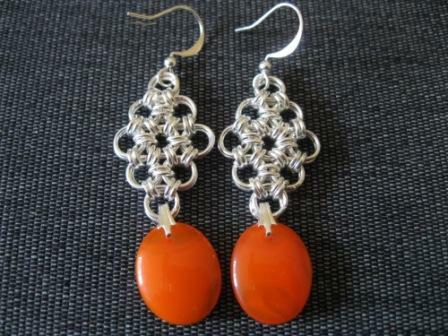 I also found an excellent way to use these fantastic bright orange oval drops as earrings! The last thing I have to share with you all today is a piece that is not quite finished, but should be by the end of the week. I don’t remember how I came up with the idea of putting this one lampwork style bead inside two copper rings of different sizes to make a gyroscope like pendant, but it worked out quite well. The chain is also based loosly on the 12 in 2, however, because it is just two lines it is really just 8 in 2. 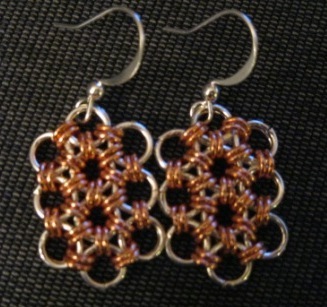 In this case, 8 in 1, because using copper 6mm rings meant I could only get 1 in to the 4mm rings, not 2. 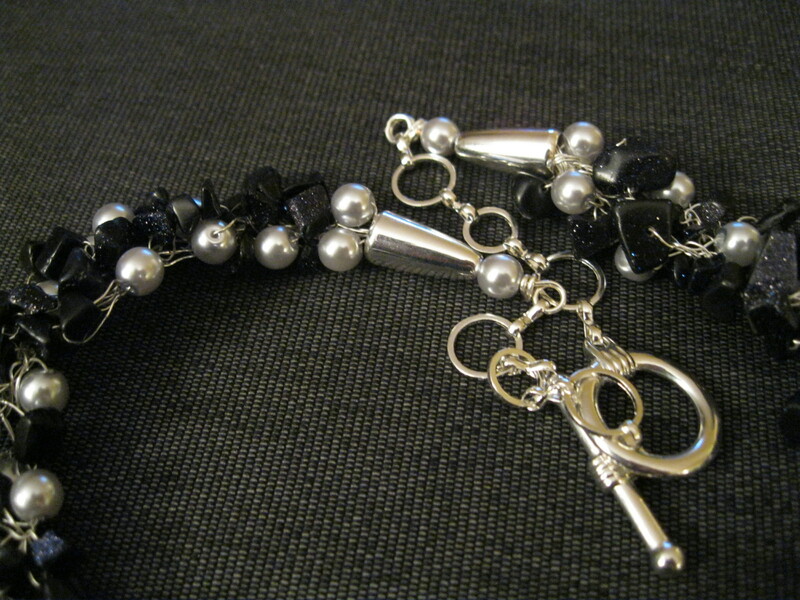 The other great thing about beading with a friend is that not only can you share ideas, and techniques (and in our case, baked good, tea, and pretzel M&M’s), you can also share beads!…or findings, clasps, rings…whatever you have run out of that your friend has. Thankfully, Meghan was able to give me a couple of lobster claws that I was needing, some 9mm rings in black nickel and I was able to give her some howlite chips for some orange beads she had, and a matching nugget for a pendant! So two heads are really better than one, and two beading stashes too! The joy of childhood wonder…how ever short the attention span. I realized this morning that it has been a lot more than a week since my last post. Admittedly, I haven’t really been doing a lot of beading lately. Until yesterday when I took my two nieces to the bead shop where I work and letting them pick out beads that they like so they could make some memory wire. The looks on their faces when the saw all of the beads was priceless. 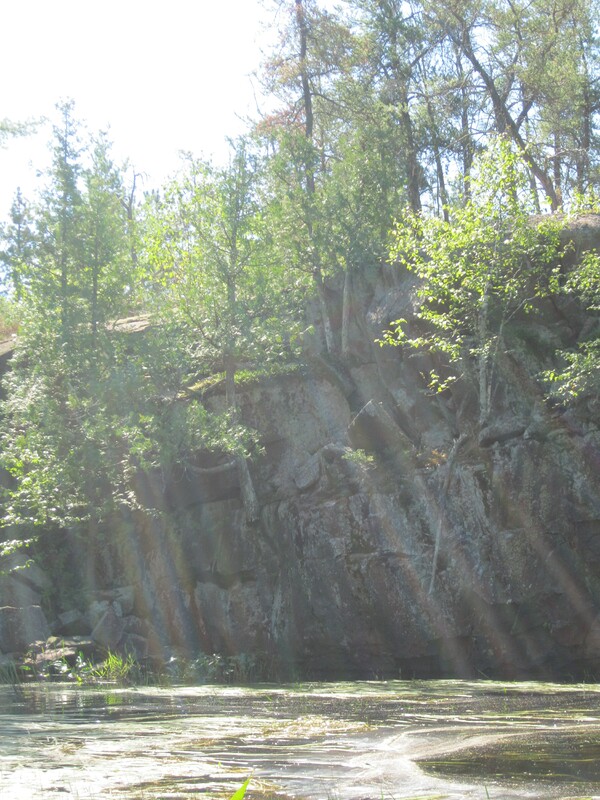 They were in total awe of the shapes, colours and textures all around them and couldn’t wait to dive right in. It was interesting to see which beads they chose to make their bracelets. One chose round red beads combined with smaller blue ones for a pattern, the younger just chose random ones. The eldest also wanted to make a set for her mum, which I helped out with…ok, I did most of it, since the attention span of a 6 year old, is not always particularly long. Either way, watching the kids have fun exploring the shop was great! 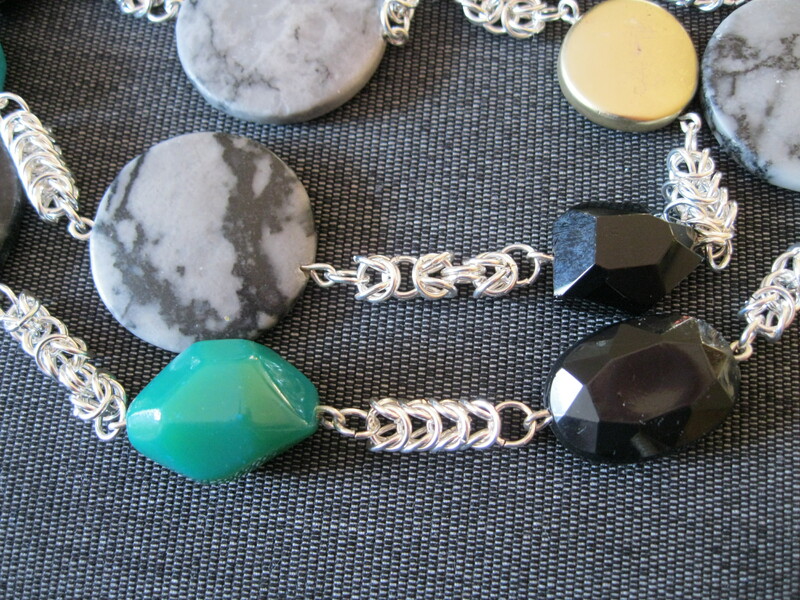 I did also make myself a memory wire bracelet with green beads in the spirit of St. Patrick’s Day, and I also managed to make another really cool bracelet of 9mm black nickel jump rings in the full Persian style, but the middle, I broke it up with a semi-precious donut. 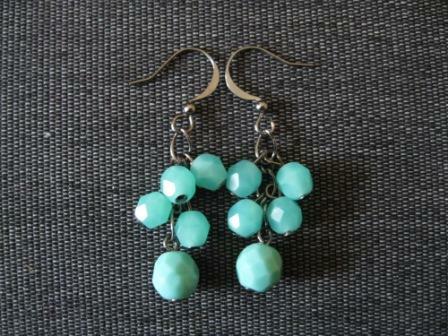 I think it might be aventurine, it is a beautiful soft milky aqua. I don’t have any pictures at the moment, but I will post some as soon as I do. Back again, and something to show for it! I know, long time no post, but I swear I have been working! 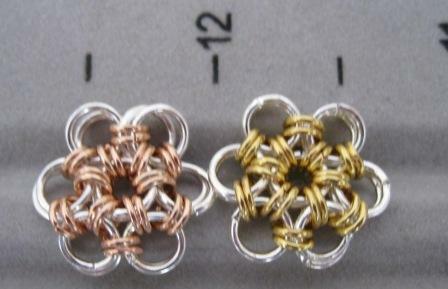 The 12-2 flower demos at the shop went really well and I think I turned a few people on to working with chain maille! 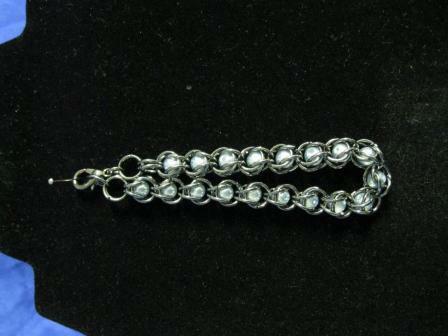 Outside of the demo’s though I haven’t done any chain maille this last week. I know…there are actually no jump rings in my couch cushions! 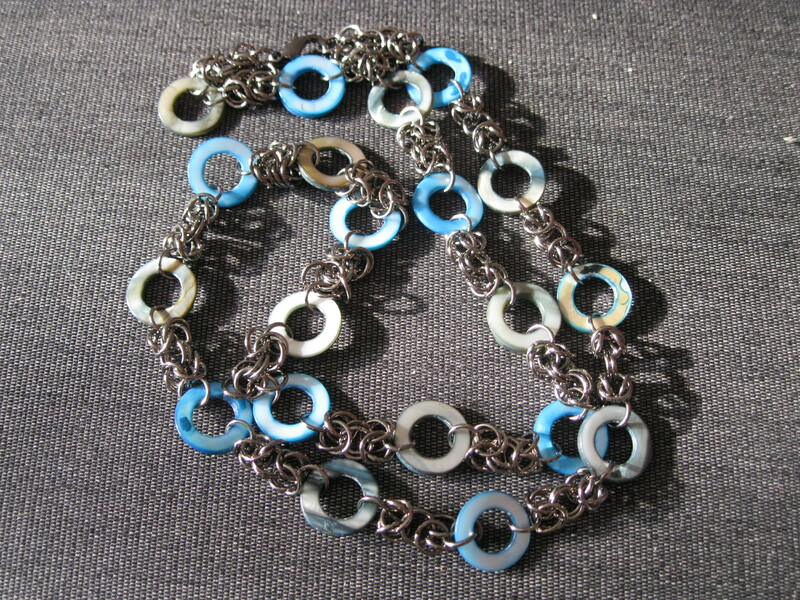 What there are in my couch cushions is seed beads, and little chips of blue sandstone…I have made two totally different crochet necklaces and I must say, I do enjoy the process, because you can take the exact same thing, a single chain stitch and make two TOTALLY different necklaces! 1. 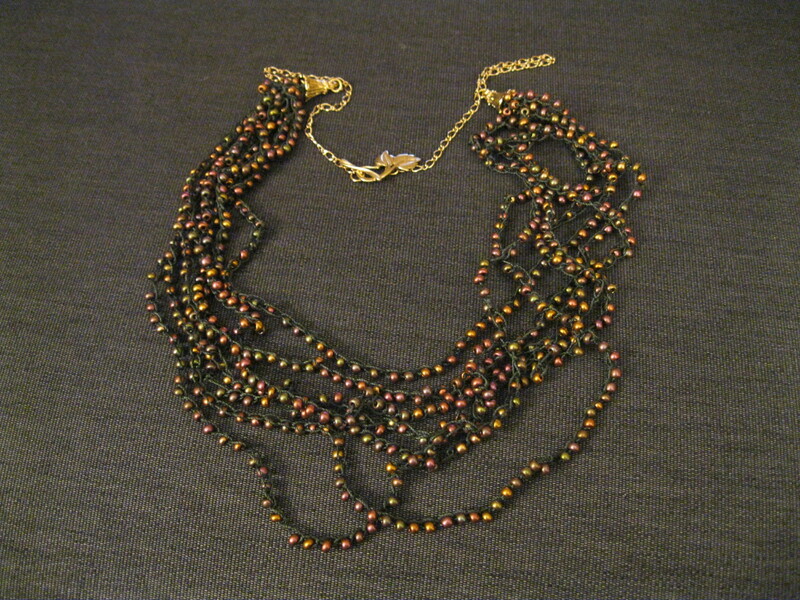 The Fall leaves Necklace, done on Super-Lon Beading Cord, multi-filament thread with sead beads. 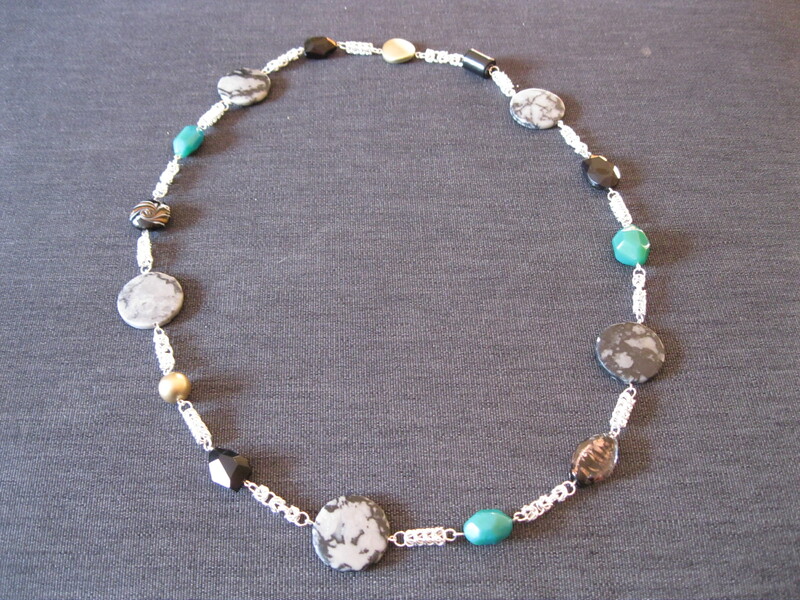 The second one, Starry Night, is made with blue sandstone chips, and glass pearls on 28 guage silver plated wire. I totally different effect! While the crocheted thread is soft and drapes nicely, the crocheted wire, is stiff and when braided forms an intricate collar! Well, that’s it for tonight folks, I have another crochet necklace on the way and then I think I will do something fun with all my little 12-2 samples from last weeks demos. I know it has been a few days since I last posted, but this was not due to lack of anything being done. What I have been busy with is preparing some new pieces for this coming week. Now here is the exciting part! This Wednesday and Friday I will be giving a chain maille flower demonstration at my work, McBead Creations in Ottawa Ontario! You can check out the shop at www.mcbeadcreations.com and there will be demonstrations going on all week, www.mcbeadcreations.com/demo.php. Here is a bit of what I have been working on! Well, that’s it for today. I am going to be busting my pliers to get that Chevron finished by this Wednesday.